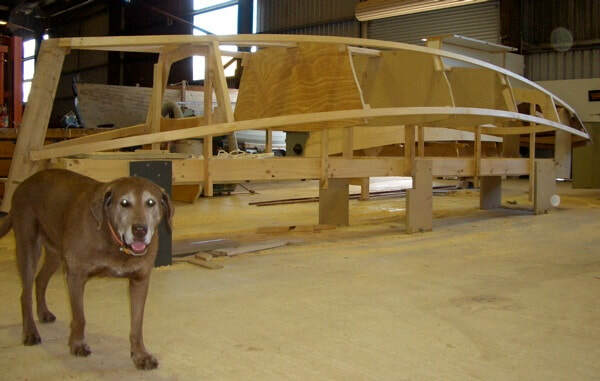 After visiting Goolwa, South Australia and the Gippsland Lakes in Victoria, I decided to get a small boat. I couldn’t find what I wanted so I built an 18’ Sharpie. 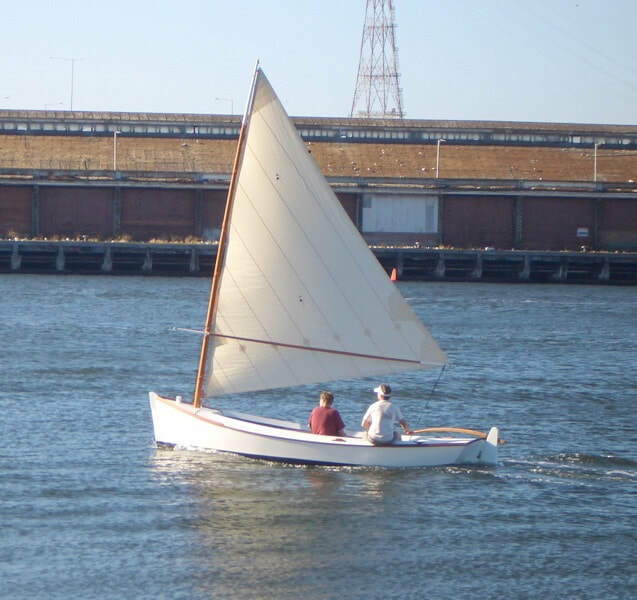 18-foot Modified Sharpie Skiff, Hooper Island, Chesapeake Bay, 1906. "The type represents the highest stage of evolution of the sharpie into the deadrise skiff. 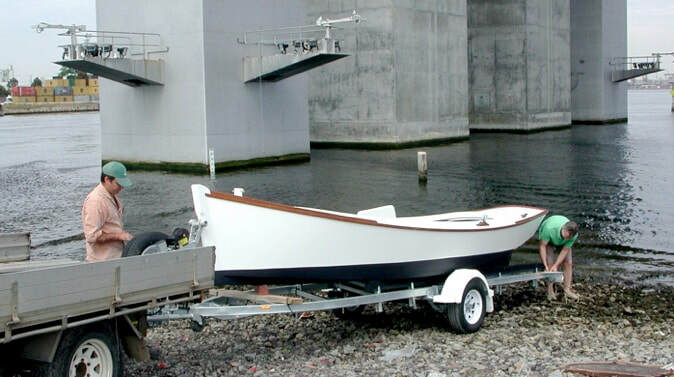 The model is moderate, neither a burdensome workboat nor a flat out racer." 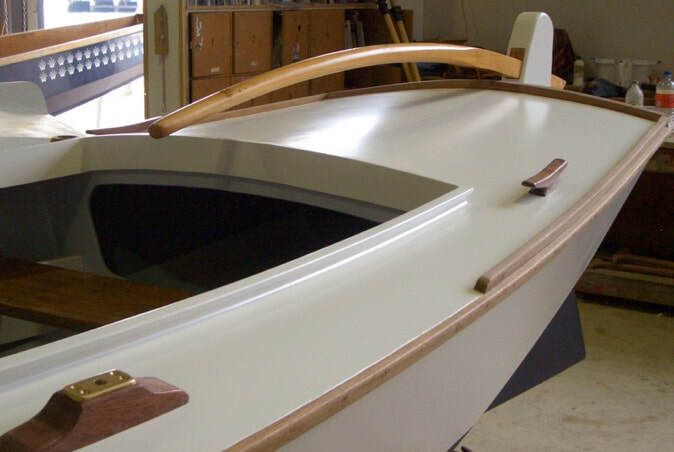 Brian at Melbourne's Wooden Boat Centre showed me how to loft the offsets of the 18-foot Modified Sharpie Skiff from Reuel B. Parker's "The Sharpie Book". 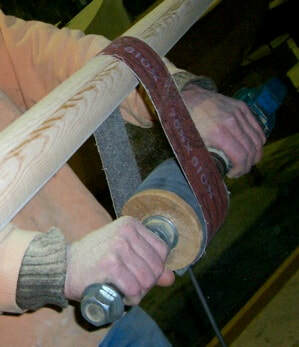 In the above photo, you can't see the lines, but you can see the batton being used to adjust the shear to please the eye. 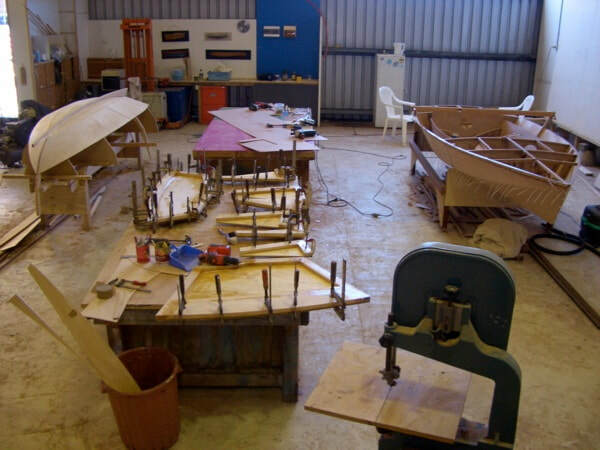 The boat is drawn full scale on The Wooden Boat Centre's drawing board. 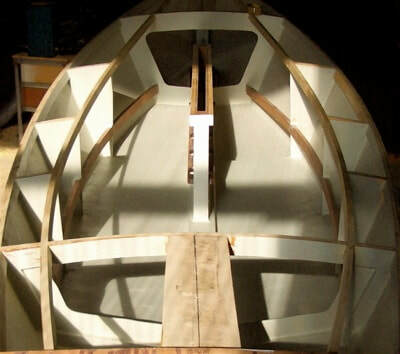 From the lofting drawings, molds, bulkheads and knees were cut. 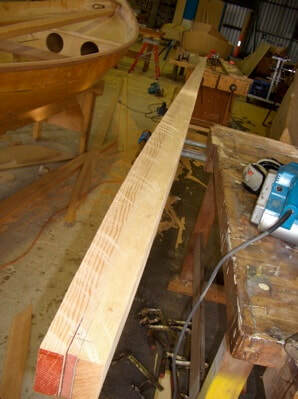 The Wooden Boat Centre procured all materials for me including the lumber for the transom seen being glued up here. My work area is in the middle. 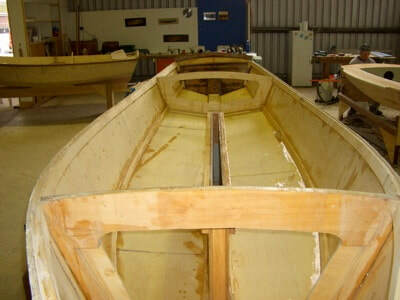 The knees and bulkheads are being glued up. Here are all the pieces laid out. The molds aren't shown. Doesn't look like much. Those pieces have to be mounted on something so I was instructed to build a "strongback". This was squared, leveled and bolted to the floor. 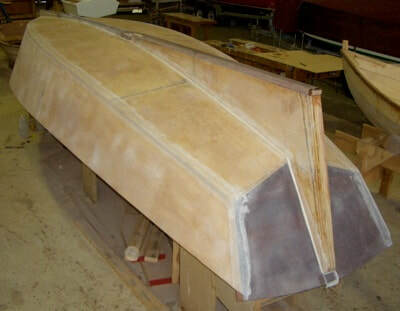 Here is the transom, aft bulkhead and 3 molds mounted on strongback. All are oriented by vertical and the building line... or they are supposed to be. Plywood doesn't come in 20 foot lengths so I had to make my own. I had a hard time believing you could simply glue plywood together but Brian assured me that it’s common practice. 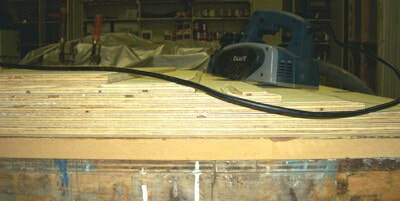 Above is a poor photo of the plywood stacked ready to make a 10 to 1 scarf. 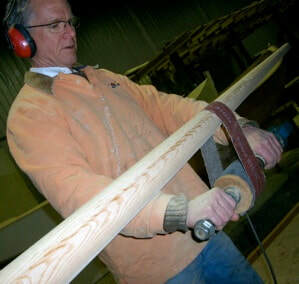 A planer, pad sander and hand plane are used to make a common angle. Here’s a even more poorly lit shot of the finished angle. Two and a half sheets of plywood glued together forming one sheet long enough to make the sides and bottoms of my Sharpie. I wisely cut luan (thin, cheap plywood) templates. 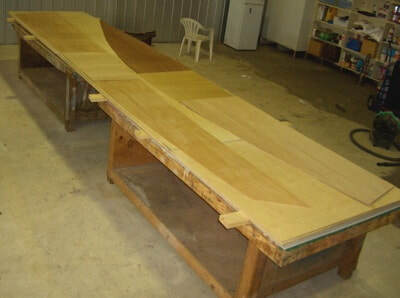 then traced the shape of the sides and bottoms onto the freshly scarfed plywood. 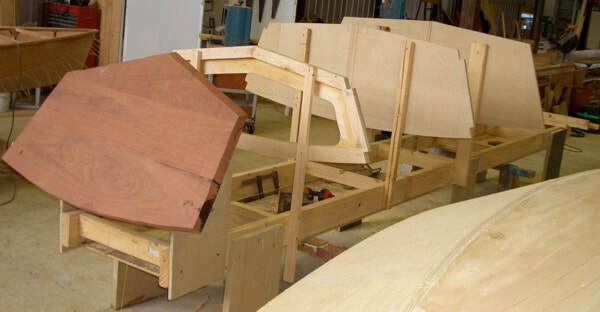 You can just make out the luan templates on top of the 2 long scarfed plywood sheets. 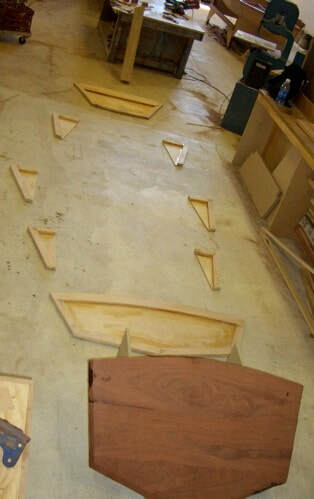 The shape was traced and then cut with a skill saw. 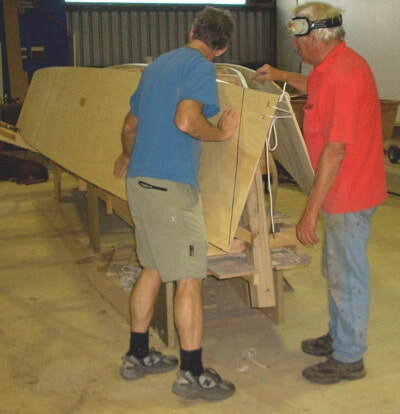 Brian (right) and myself checking the fit before epoxying. 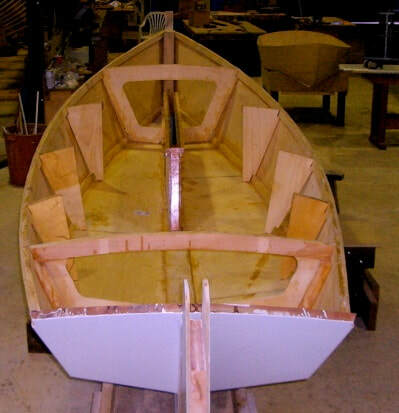 The sides are epoxyed on. 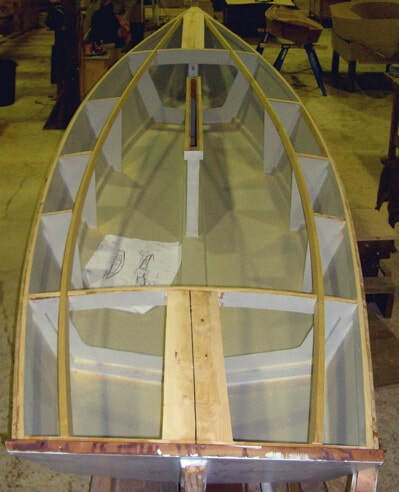 Sides and bottoms glued in place. 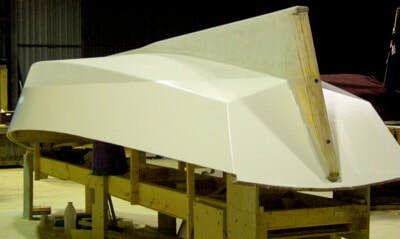 Keel and gripe (forward mini keel) in place. 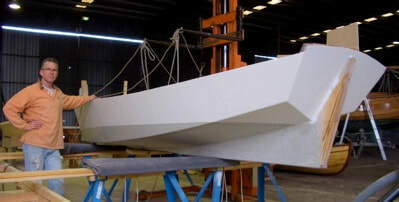 The hull is covered in Dynel cloth set in epoxy for abrasion resistance. and filled and sanded once more, and then again. The waterline sets off the curves. Finally the day came to flip the boat upright. It was very exciting! First look inside. Molds have been removed. 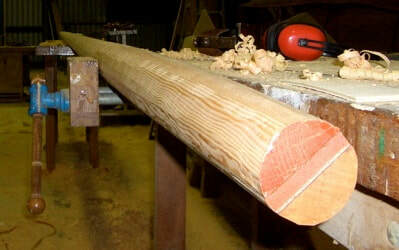 All joints were filleted. 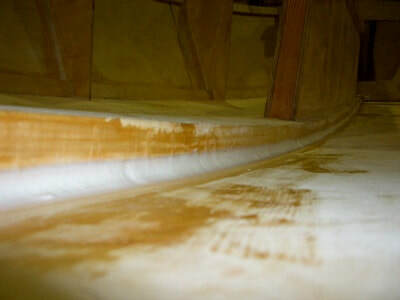 That's the thickened white epoxy making a 90 degree joint into a nice curve. Inside sealed with epoxy and primed. Carlins in place. The rough cut decks temporarily put on for the visual reward. 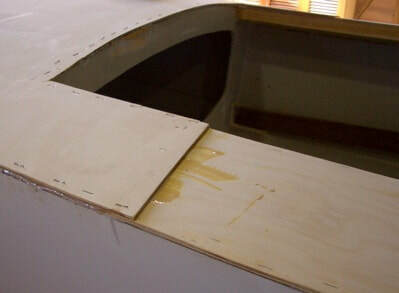 miniature hand rail on the sides of the centre board trunk. Now there is a place to tie stuff down. 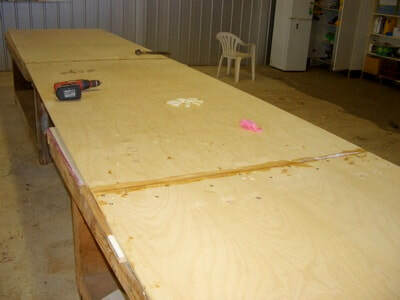 Here's the second layer of 4mm Hoop Pine plywood being glued down using stainless steel staples. 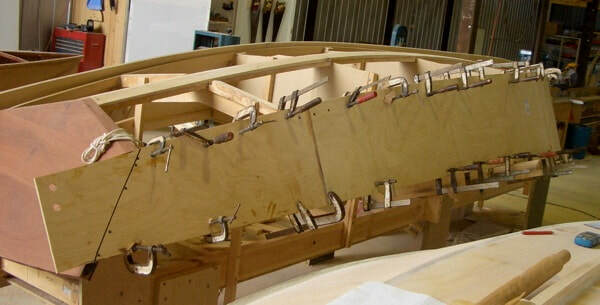 Using two layers made it easier to follow the curve of the bulkheads. Some crown actually followed into the side decks. 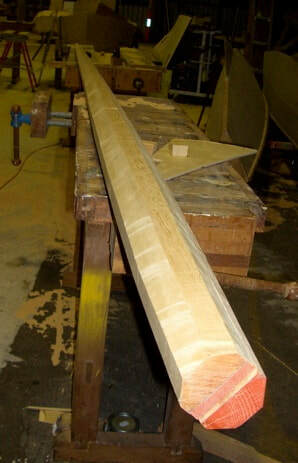 Brian lucked up and found some beautiful straight grained Oregon being glued up here to make a 4" x4" x 20' board. After running it through the planer I made a few measurements and using a batton, drew the taper lines. 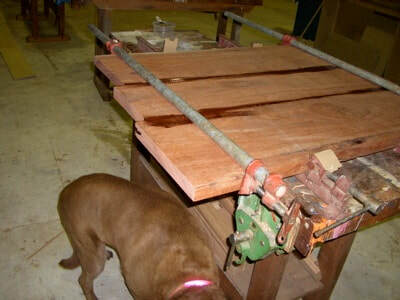 I was very hesitant to put a saw to this very expensive piece of timber but it had to be made 8 sided. And then 16 sided and then the ridges were hand planed. Rob brought in his "mast rounder" drill attachment. It saved me hours of hand sanding. 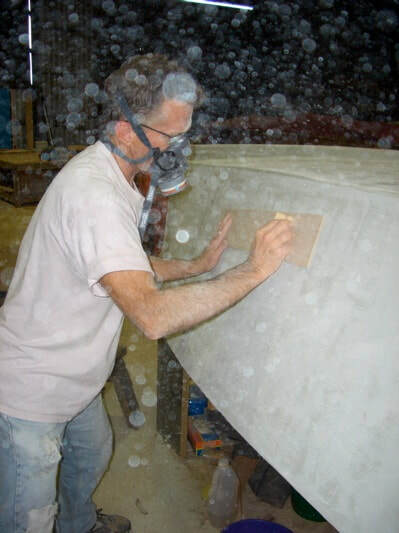 There's always a little more sanding to be done. 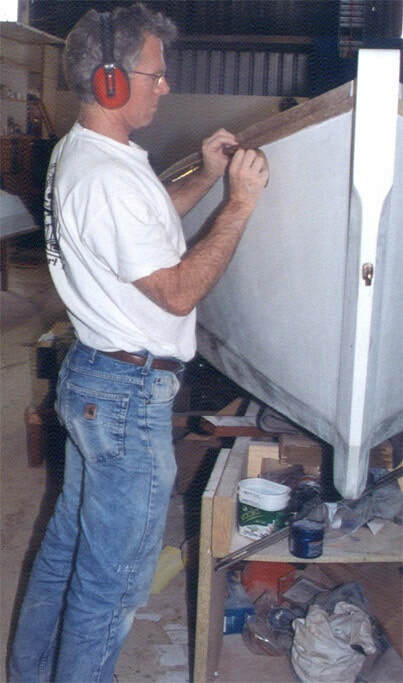 to give the paint a satin non-shinny finish. The shop lights give the decks a yellow tint. 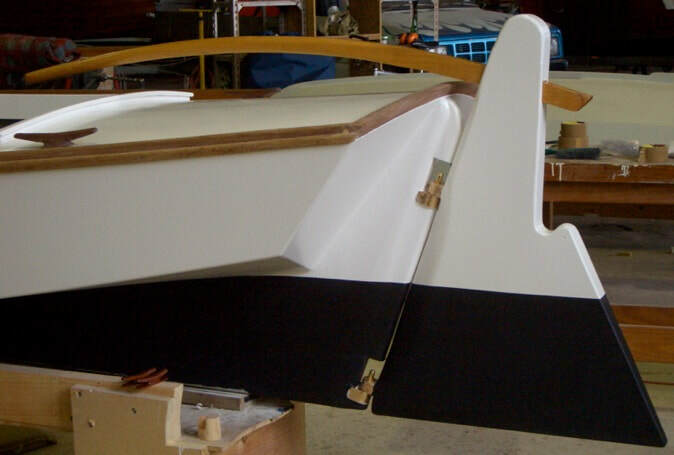 I think the gudgeons and pintles (rudder hinges) are large enough. Rubrails, toerails, mast etc. are done with Deks Olje. I didn't plan on having any bright work but couldn't help myself. On Nov. 25, 2006 Dan backed "Tempo" down the rocky slope at the end of North Wharf Road under the Bolte Bridge. 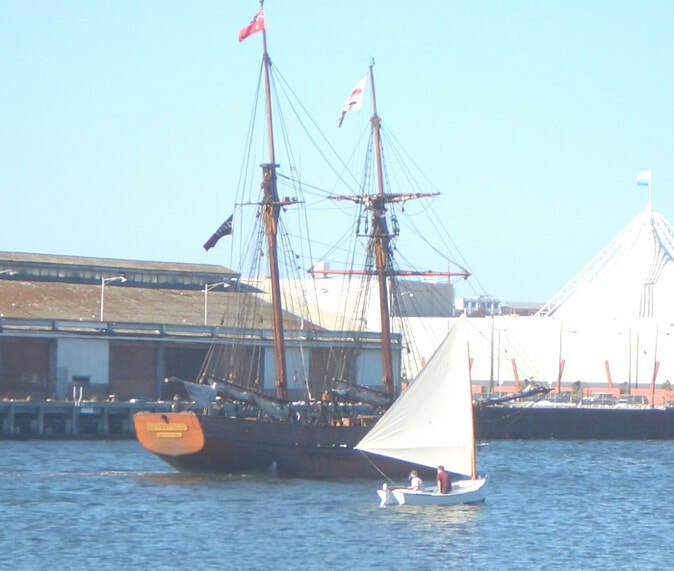 ...where I popped in the mast, hoisted the new sail (made by Col Anderson) and went for a sail. 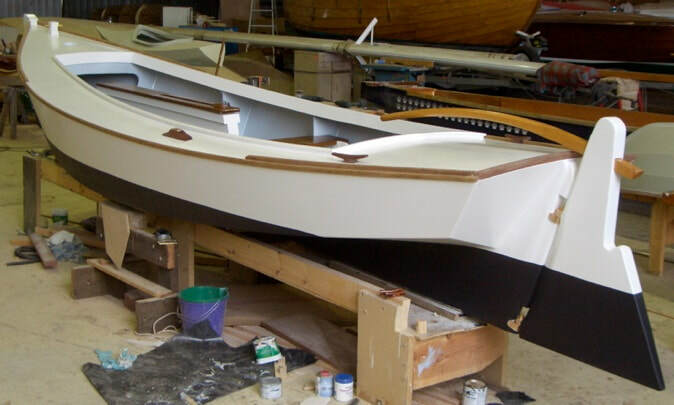 She tacks in a "stately fashion" but will tack in very light airs. The helm is neutral except in strong gust where she heads up. Later that day we tacked out to the Westgate Bridge and into the white caps coming in from Port Philip Bay. She was over canvassed but predictable. I wish I had some photos of Tempo with her rails awash. The downwind run back the the WBC was quick. I fear we violated the 5 kt. speed limit. 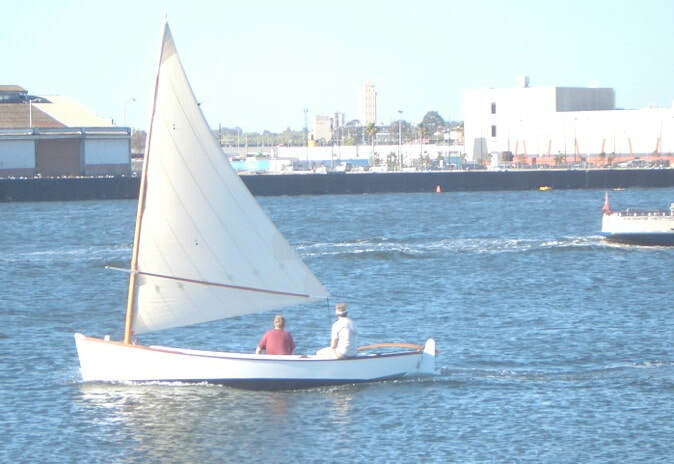 The next afternoon I took Gladys for a quiet sail. I had to wake her up for this shot.